In the new movie, “Fat Albert ,” the junkyard gang steps out of an animated Philadelphia of the 1970s and into the real world today, which is quite a different place, and not just because Bill Cosby’s become old and cranky. When the classic Filmation cartoon premiered in 1972, hip hop culture didn’t exist yet, kids were still listening to music on LP and 8-track tape, the Viet Nam War was still raging, and perhaps most importantly, nobody had cable TV. Okay, maybe “most importantly” is a slight exaggeration, but what kids today don’t realize is how good they’ve got it in this era of the Cartoon Network, Nickelodeon and the countless other cable channels geared exclusively to them. Back when Fat Albert first Hey Hey Hey’d on TV, there were only a fistful of networks creating new programming, and only one block of time in the entire week was specifically geared towards kids: Saturday mornings. It’s impossible to overstate the sociological import of the golden age of Saturday morning TV. From the 1960s through the 1980s, Saturday morning was the one time when kids ruled the tube. The major networks, CBS, NBC and ABC made almost as big a deal about their Saturday morning fall lineup as they did prime time. Centerspread ads for the new shows were placed in comic books, half hour preview specials (one hosted by Darth Vader) aired on the Friday night before the first new Saturday morning of the fall. It was a big deal. But in those years in between, Saturday morning flourished with a delicious sugary mixture of comedy and violence. “George of the Jungle ,” “Wacky Races ,” “Josie and the Pussycats ,” “Scooby Doo, Where are You? ” “the Jetsons ” and “the Pink Panther ” were not only hilarious (or at least we thought so), they all had really cool theme songs. Cartoon crimefighters the Herculoids , Superman , Batman and Aquaman (both in solo cartoons in the ‘60s and then teamed in the “Super Friends ” in the ‘70s), Spider-Man , the Lone Ranger and Speed Racer actually beat up bad guys until children’s watchdogs groups put an end to the fisticuffs in the ‘80s and made Tarzan and He-Man reason with villains to show them the error of their ways. Even the educational stuff was entertaining... anyone who grew up in the ‘70s can recite the preamble to the Constitution, but only if they’re allowed to sing it, as learned from the legendary “Schoolhouse Rock ” bumpers on ABC. CBS had “In the News,” short features about current events that played like “5 Minutes” (instead of 60) for youngsters. There was a subtle maturation that occurred for many during this period as well. One Saturday morning, all those curious pop culture references, caricatures of Hitler and Teddy Roosevelt and usage of really old songs on “the Bugs Bunny / Road Runner Show ” make sense.... “Hey! These cartoons are really OLD! 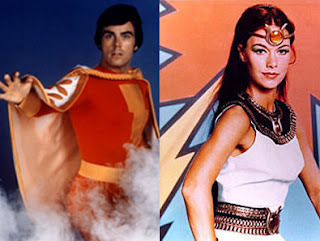 They weren’t made for me, they were made for my PARENTS!” That moment when a kid realizes that pop culture existed before they were born is a key epiphany. Suddenly the world doesn’t revolve around them quite as much. But it wasn’t just the programming that made Saturday mornings such an indelible part of youth. Everything was different in those early hours of the weekend. We got up before our parents and fed ourselves, usually bowls of brightly dyed cereal that (back then) had the word “Sugar” in the name. We’d have to sometimes battle with siblings over what shows we’d watch and drool at the commercials for toys and games that would never pass consumer safety organizations (or the department of Homeland Security) today. 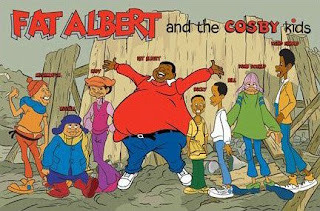 “Fat Albert and the Cosby Kids ” stands as one of the most important and influential shows of that period, both for better and worse (It’s like the “Sgt. Pepper’s Lonely Hearts Club Band ” of cartoons: Did it elevate the artform or kill it?). On the one hand, it was genuinely funny and the first time urban life was depicted with some realism in a kid’s show. The songs performed by the Junkyard Band were really catchy (“Beggin’ Benny” remains our favorite and begs for an Outkast cover version). 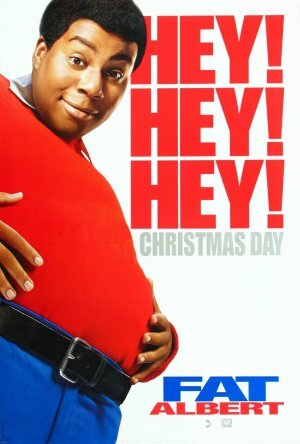 But “Fat Albert” was also the first cartoon to shove moral messages down kids’ throats, sometimes to the point where one needed a politically incorrect Heimlich from Dudley Do-Right or the Go-Go Gophers to knock it loose. If kids felt kinda bummed by being lectured to by Bill Cosby, that feeling was only exacerbated by what was to come next. “Fat Albert and the Cosby Kids” was always the last cartoon of the morning, with just one more bit of kidvid remaining that day. “The CBS Children’s Film Festival,” was an hour long anthology show that showed usually depressing foreign films about Swedish boys losing their balloons. Hosted by ‘50s holdovers Kukla, Fran and Ollie (two hand puppets, one actress / singer / teacher), the show almost seemed designed to make you want to turn off the TV and get some fresh air. Which is usually what happened. There were no video games to play, no cable channels to pick up the slack, unless you wanted to watch old movies or shows about fishing. It was time to go outside and play, to meet up with your friends and start getting dirty before dinner. It was a good time. The impact of that golden age of Saturday morning cartoons is evident in much entertainment created for (at least somewhat) older audiences. We’ve been subjected to big budget, live action films of “Scooby Doo ,” “the Flintstones ” “Rocky and Bullwinkle ” and “Josie and the Pussycats .” “Space Ghost ” fought interstellar evil in the ‘60s before becoming a sarcastic talk show host in the ‘90s on “Space Ghost Coast to Coast .” Other Hanna-Barbera adventure shows, “Sealab 2020” and “Birdman ” have been tinkered with to create satire for the Cartoon Network’s “Adult Swim ” block of programming, which this year also brought us the brilliant “The Venture Bros. ” Created by Chris McCulloch (a veteran of “the Tick ,”) “Venture” is a loving homage to “Jonny Quest ,” “the Fantastic Four” and dozens of other violent shows of that era.